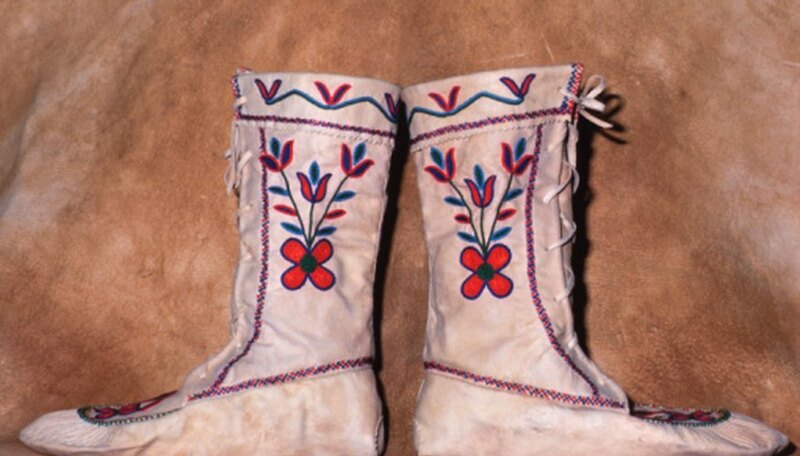 The Navajo Shoe Game is a game of chance, traditionally played in winter. The mythical story behind the Shoe Game is that centuries ago, the day creatures and the night creatures did not understand the cycles of the universe, as each group wanted it to be day or night all the time. A contest was held to see which group was more powerful, and this was the first shoe game. In the end, it was understood that neither group held more power and the animals understood the balance of day and night cycles. Split the group into two teams. One team will represent the day animals, and the other group will represent the night animals. Choose the starting team by tossing a coin. This team will get the ball first. Hide the ball in one of the shoes and then fill all of the shoes with sand. The team that won the coin toss works cooperatively to choose the shoe that will hide the ball. Traditionally, the ball is made from twisted and wrapped yucca root, but you may use any small ball, such as a golf ball. Sing animal songs in Navajo while the other team is guessing, per the Navajo Shoe Game tradition. You may choose to sing any animal songs if you do not know the traditional Shoe Game songs. These songs usually are meant to distract players from the game, but are also a traditional storytelling method. Continue guessing until the correct shoe is found. The ball switches sides and the other team now has a chance to hide it. In a traditional Navajo Shoe Game, when a team guesses the correct shoe, the opposing team must pay them 102 yucca roots. Also, the winning team must surrender their 102 yucca roots to the losing team. In this way, the Navajo Shoe Game has no winner.